Cooking Fresh Shrimp... Rule #1 ! Don't Over Cook Them. Shrimp is one of the easiest shellfish to cook. They can be cooked in an number of different ways and adapt well to many shrimp recipes. The second rule in cooking fresh shrimp is to start with a high quality shrimp, one that is full of flavor, firm and sweet. I prefer to always buy raw gulf shrimp in the shell for any way I plan on cooking shrimp. They are less processed and result in a better flavor. Shrimp are very easy to peel and devein. 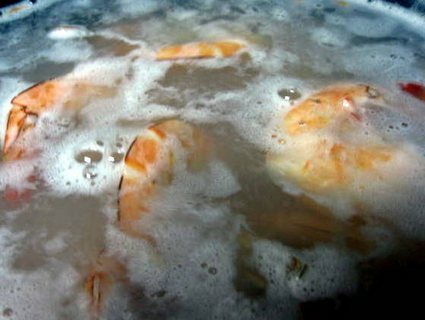 An already peeled and deveined shrimp looses a lot of its flavor when they are processed. The same goes for already cooked peeled and deveined shrimp that you can buy frozen, to me they're just not as flavorful as a shell on shrimp. Cooking Tips: #1. 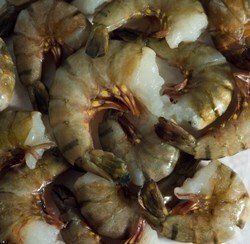 If you have quickly thawed your shrimp under cold water, check and make sure they all are completely thawed. Raw shrimp at different temperatures will result in under and over cooked shrimp. #2. Shrimp removed directly from the refrigerator and cooked might need more time to cook than shrimp that have set out awhile. So you might have to adjust your cooking time. So to have great shrimp, know what kind of shrimp you are buying, buy them in the shell, peel your own and get cooking. In large pot bring your water(4-6 cups of water per pound of shrimp) and any crawfish and shrimp boil you are using, to a full boil. Once your water has come to a full rolling boil, add your shrimp and stir to separate them. Cover with lid and turn off your stove burner and let sit. Small shrimp ( more than 50 per pound) will be cooked in 2 to 3 minutes, Large(31-35 per pound) shrimp in about 6 to 8 minutes. Note: These times are for 1 pound of shrimp. To check for doneness, take a shrimp out and cut through the thickest part, it should be opaque. Another thing that will affect your cooking time is the temperature of the shrimp. The colder the shrimp the longer it is going to take to cook them. When cooked remove from the stove and drain in a colander, then dump your shrimp into ice water to stop the cooking. Stir the shrimp around in the ice water to make sure they all get cooled. Then drain well and serve, or if you will be using them later put them in a air tight container and place in the refrigerator. Tip: I like to put a couple of paper towels in the bottom of the container to absorb more moisture as the shrimp set in the refrigerator. Here is another way to cook shrimp on the stove, complete with pictures. Pre heat your broiler, place the shrimp on a cookie sheet or broiler pan. Baste your shrimp with a liquid,(butter, olive oil, etc) place in the broiler and cook for 4 to 5 minutes, turning the shrimp halfway through the cooking time. Pre-heat your skillet, a medium to medium-high heat works the best. In a large skillet add your oil, butter and any other seasoning you might be using. Once the oil or butter becomes hot, add your shrimp and cook about 2 to 2 1/2 minutes per side of shrimp. Do not over load the pan with shrimp, too many shrimp in a pan will cause them to release too much water and you will be steaming your shrimp instead of sauteing them. Steaming shrimp is one of the easiest ways of cooking shrimp. You will need a steamer basket and a large pot. You can season your water with any seasoning you like, make sure the water is almost at the bottom of the steamer basket. Bring the water to a full boil, put your shrimp in the basket and cover tightly. Cook until your shrimp are pink and the meat is opaque. Depending on the size of shrimp and the amount of shrimp you are steaming, will determine the exact cooking time. If you like extra seasoning on your shrimp, place the shrimp in layers in the basket and add your seasoning to each layer. Another super easy and an almost full proof way of steaming perfect shrimp is to use an electric food steamer. Just add the right amount of water, recommended for the amount of shrimp you are cooking and let it cook. You can make perfect cocktail shrimp by baking them. Preheat your oven to 400 degrees, place your peeled and deveined in a single layer,on a cookie sheet, drizzle with a little olive oil and sprinkle some salt on them. Bake for about 8 to 10 minutes. You want them to be pink, firm and opaque. Remove from oven and allow to cool before serving. This video shows you how to devein shrimp and butterfly them.